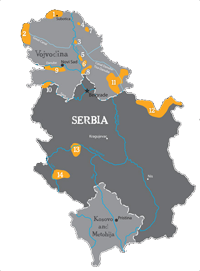 Serbia has long enjoyed its reputation as acultural crossroads at the heart of Europe. This small, landlocked nation of little more than 100,000 square kilometres boasts an astonishing diversity of habitats: from flooded forest and reedbed swamps to arid steppes and dramatic mountain gorges. A huge variety of wildlife thrives here, making Serbia one of Europe's greatest biodiversity hotspots. Enjoy birdwatching in Serbia! For photos from Serbia birding tours and Serbia nature, visit our PHOTO GALLERY! In addition to outstanding birdlife, apart from birding tours in Serbia, the visiting birders can enjoy a host of cultural and historical attractions, from castles, museums and monasteries to rural farmsteads and Belgrade's vibrant nightlife. All this is accompanied by a tradition of warmth and hospitality for which Serbia is justly famous. Birwatching in Serbia Catalogue NEW!!! The main threats include agricultural intensification, disturbance and hunting.